She is quite a shy girl but gained confidence during her interview. She comes from quite a large family of 5 girls and 2 boys; she is the 4th born. She father died after a stroke in 2012 but her mother is still alive. She has a step father and a new 2 year old brother. 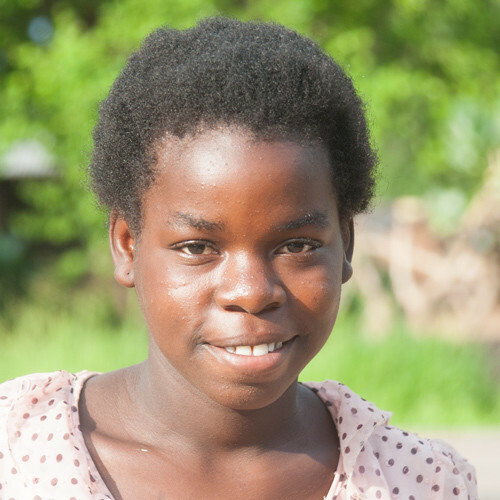 The family are subsistence farmers from a poor rural area and cannot afford the school fees, uniform of needs of Evelyn attend secondary school. You can get an idea of which subjects the pupil likes or is good at by looking at his or her marks. English and mathematics are obvious but you might like an explanation of the other subjects. Social and Development Studies is all about geography, history and civics. Zambian Language is the study of one of the many languages used in Zambia; in this area it is Chinyanja. Creative and Technology Studies is a mix or practical subjects such as arts and crafts. The marks may also indicate the type person, especially when it comes to the Special Papers; Special Paper 1 is a simple and basic IQ test based on English and Maths logic and Special Paper 2 is a basic visual IQ test based on patterns.